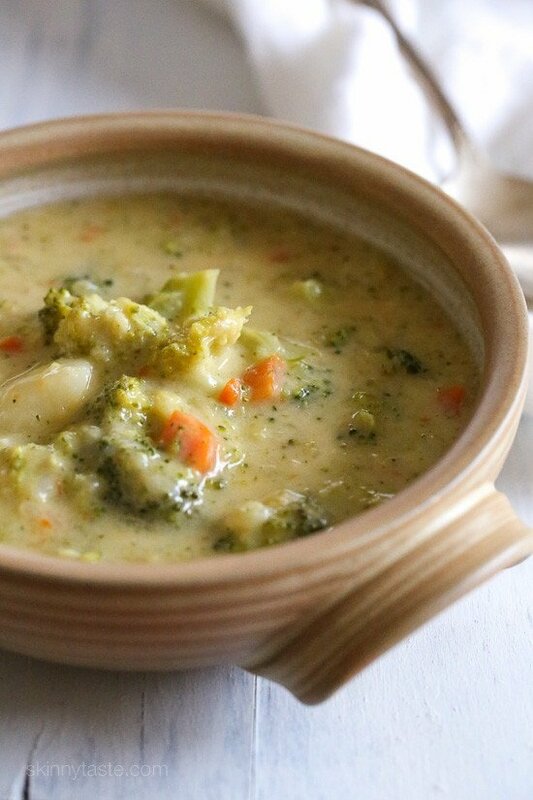 This thick and creamy broccoli, cheese and potato soup is lick-the-bowl good! Pure comfort in a bowl, a one-pot meal your whole family will love and ready in under 30 minutes. As the weather is getting cooler, it’s the perfect soup to warm up and leftovers are great to pack for lunch. When I was a kid, broccoli and cheese was my favorite thing to eat. Anytime we had leftover broccoli I would always heat it up the next day with melted cheese. This soup reminds me of those after school meals I would make for myself. What are some of your favorite childhood soups? 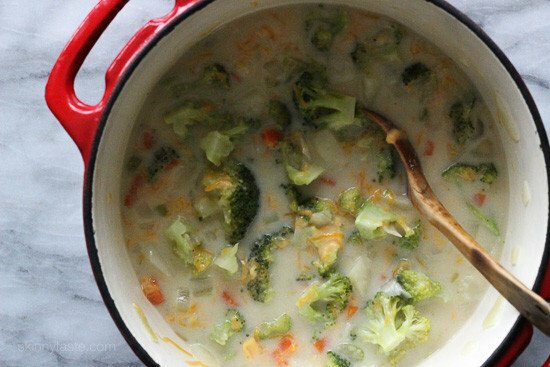 This thick and creamy broccoli, cheese and potato soup is lick-the-bowl good! Pure comfort in a bowl, a one-pot meal your whole family will love and ready in under 30 minutes. 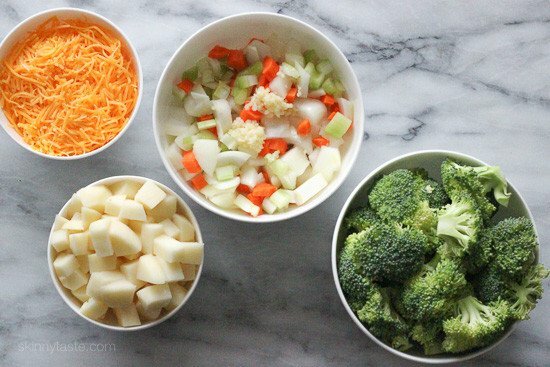 , quickly blend part of the soup for a quick second or two. If you don’t have an immersion blender, remove about 1-2 cups of potatoes and broccoli, place it in your chopper, then add it back to the soup. This helps thicken it a bit. Can this be made in an Instant Pot? Or is stove top the best bet? I love soup! I always looking for a new way to enjoy new soup recipes. Thank you so much for sharing great details. Must try! Could riced cauliflower be used in place of the potato? Yummy and filling, this is a new favorite in my house! And so quick to make, I just love this one! Oh. My. Goodness. I don’t usually leave reviews, but this one deserves it. I made this ahead for dinner tonight, and I am counting down the minutes until it’s time to eat. It’s the best broccoli cheese soup I have every tasted! I opted not to blend it at the end because the soup was plenty thick already and I like the chunks of broccoli in it. I made this because I had all of the ingredients on hand and they needed to be used up. The soup was great! Very good! I used one 32 oz carton of vegetable broth, no milk, and only 1 Tbsp of flour. because I don’t like it that thick. After using the immersion blender and adding the sharp cheddar cheese it was plenty thick for me. Left out onions as I can’t eat them. Can’t stand American cheese so didn’t use that. Loved the added taste of the Parmesan! Will be making again. VERY tasty! Frozen chopped broccoli is by far the best and easiest to use in this recipe. For this recipe, I use about half of a one lb. bag. OMG! this is some good tasting soup! Kids loved it! This is going to be a regular recipe! I’m curious, I don’t have the 2% American cheese, will it change the texture or taste of the soup if I omit it? I made it without the American cheese and it was delicious! Making this for the second time this month 🙂 I went with one huge sweet potato instead of two medium white potatoes. Trying it in the IP this time as mentioned above. We love t his soup!! I don’t own a food processor, does it matter if I don’t do this for the first step? As a Skinny Taste newbie, I wanted to let you know the 3-4 recipes I’ve made have all been huge hits, including this last night. Hands down my favorite broccoli cheese soup. would this be ok w frozen broccoli? Super yummy! My son has a dairy allergy so we just thickened this up with a little extra flour and potatoes. It was delicious! The cheese and milk really wasn’t missed so bonus for less calories! Made the soup today. It was so delicious. I’ve made this twice so far. I love it! OMG! I made this tonight and it turned out SO well. I used vegetarian broth and 2% fairlife milk as it has more protein and less sugar but other than that stuck to the recipe. Can’t wait for lunch tomorrow! I would love to decrease the carbs just a little. Thinking of trying half cauliflower, half potato. Has anyone tried that? That’s exactly what I did this past weekend when I made it. I used 1 potato and 1 cup of cauliflower. I added the cauliflower later when I added the broccoli. The soup was delicious! Question? You have been using pureed cauliflower a lot lately to thicken soups. Do you think that would work in this recipe as opposed to the potatoes? It would certainly make it healthier and lower in calories and WW points. Would using cornstarch vs. any of the flour options serve the same purpose? Can you make this in an instant pot? I’ve made your recipe the traditional way and it was delicious, just wondering if the instant pot is an option. Thanks! I wanted to know the same thing! I’m going to look up an insta pot recipe and convert to her ingredients. I don;t freeze soups with milk or cheese, so not sure. Is there a way to reduce the sodium in this recipe or does most of it come from the cheese? Quite good except I had to add another cup of broth to thin it out a bit. I also put it in the blender at the end. It was sooo good! Great, easy recipe! The potatoes and the blending really add body without it feeling heavy. For the milk, I used Trader joe’s unflavored coconut creamer plus a little water because my husband drank the milk in the fridge and that’s all we had left 😛 It still turned out delicious and comforting. A keeper! Funny, I was in the mood for brocolli soup at 11:00 last night and made something very similar. Large bag (5 cups) frozen winter blend (cauli/broccoli mix) simmered with some chopped onion and a little garlic in 2 c chic broth. Used immersion blender when softened, Added 1/2 c low fat milk & 1/2 c low fat shredded cheddar & nutmeg to taste. Quick, easy & delish! I will definitely try your recipe! We starved. Not nearly enough protein, let alone calories. Will try as a side dish next time. My hubby just raved and raved about this soup. I could not find low-fat American cheese in the deli, so I used 1.5 oz of a Smokey gruyere, as I had it on had. I bumped the broth to 3 cups to get the soup to 8 cups. I used 20 oz of potato. For those adjustments, I got 6 SP for 1 cup for Weight Watchers. Hi! Question about the amount of cheddar cheese… if I’m using a block of cheddar and shredding it myself, do I shred enough to fit into a cup and a half? I can never figure out the cheese ratios!?! Awesome soup. I substituted leek for the onion and it went very well with the potatoe. Wondering if you could make this in a crockpot?? I’ve made this twice in less than two weeks and it’s been such a hit. Simple ingredients and easy to make, and it tastes better than any broccoli cheese soup I’ve had in restaurants! I’ve been following your site for a while, own all three cookbooks, and I hardly ever make any recipes that aren’t from SkinnyTaste. Thank you, Gina! You’re welcome Christina! Glad you enjoyed it! Thank you for this recipe and your recipe plans. I really appreciate it. Oh my word! This soup is incredible! I had some leftover broccoli, carrots, and potatoes from another dinner I cooked earlier in the week. I didn’t want them to go to waste, so I thought, “Soup would be great!” I came across your recipe and it did not disappoint. Could I put it all together in the instapot? Made this for my 78-year-old dad today and he absolutely loved it! He kept saying how good it was, which he doesn’t usually do. I followed the recipe exactly. This soup was amazing! Like many others, I too left out the American Cheese slices. In my opinion this recipe didn’t need it. I will make one other adjustment next time, however. I will run my immersion blender through the soup BEFORE I add the cheese at the end. I had a little bit of a tough time getting the cheese off of the blender! ? Love this recipe. I use sweet potatoes instead of white.Delish! My children, family and guests have LOVED this dish! Absolutely delicious! Well worth the time dicing and chopping. I hope to eat it this week for lunch, if my husband leaves me any! Is this soup best the day you make it (because of the dairy) or does it get better the 2nd and 3rd day? Thanks-I’m making it for tomorrow. I just realized today that just about everything I make is a Skinnytaste recipe, either from the website or your 2 cookbooks – I can’t wait for the new one! 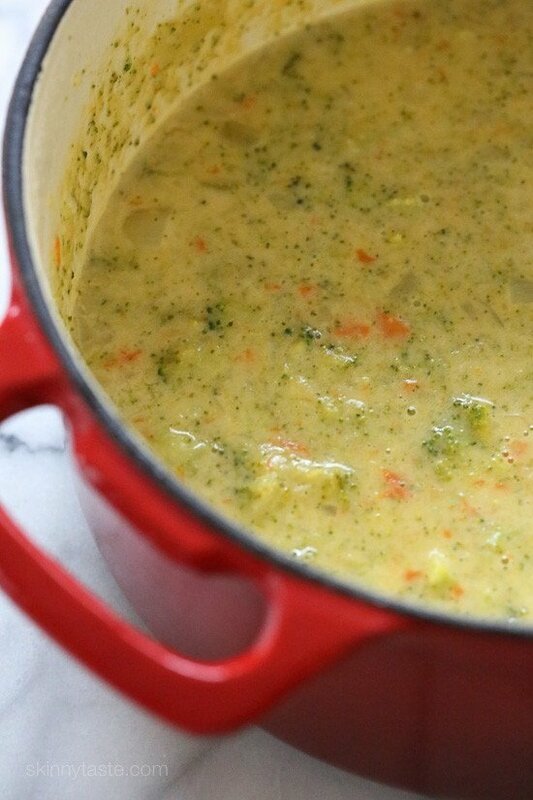 This soup is always a family favorite. When 2 teens and a picky husband like it, there is nothing more to say. Thank you Gina ! I was in a hurry, so I through everything except the milk, flour and cheese into my Instant Pot for 15 minutes. Then I pureed it and stirred in the rest. It was VERY GOOD. This soup is so easy to make, and SOOOO delicious! It is hard to stop at one serving. I will definitely be making this again soon. Luv this recipe. We like chunky soup, so I didn’t follow the blending step. Recipe a “keeper”. Gina, I’d love a substitute for the broccoli. Any suggestions? And thanks for doing what you do. I love receiving your meal plans, with WW Freestlye Points attached! Assume frozen broccoli would work ok?? My 1 yr old and 2.5 yr olds devour this soup every time. I used bone broth this time just for an extra kick of nutrients. I change the veggie to liquid ratios whenever and it always works out. It’s fool proof really. I love love it. This is a quick and yummy soup. I added mushrooms and frozen corn kernels just to give it more vegetables. OMG!!! Yum Yum Yum! Super easy to make and delicious 🙂 Perfect for a cold wet windy day! I love it! Can this be made in the IP? Love your site! Husband said make it again – which was great because I was using up a giant bag of Costco broccoli and doubled the recipe! Of course that means I’ll have to share the leftovers! This soup is awesome! I have to make this at least every other week. My husband cannot get enough. He is diabetic and this low fat no heavy cream soup helps him keep his blood sugar on the right track. Keep your wonderful recipes coming! 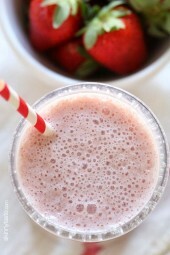 I would love to try this recipe but I can’t do much dairy. The cheddar cheese would be fine, but not american, I can do greek yogurt… do you think subbing that in along with some non-dairy milk and cheddar could work, or would it be a mess? Loved it. I used 2% milk instead of the fat free. I also left it chunky. This sounds amazing! Can almond milk be used instead of the fat free milk? Haven’t tried but it may work ok. I tried it and still liked it! Hokey smokes!! I’ll admit, I wasn’t expecting to like this too much but boy was I surprised!! It’s FABULOUS!! Even my cooked broccoli disliking husband said it was good!! I made it just as directed, even got to use my emersion blender for the first time!! When I served it, I topped it with a sprinkle of cheddar cheese and a few bacon bits. Made the soup with a Jersey sweet potato instead and it gave the soup just a hint of sweetness! Love all of your recipes!! Thank You! I used extra garlic, extra broth, and excluded the potatoes. Came out delicious! Will def make it again. Delish! Pretty quick too! I used full fat cheese though! This was a good one! I prefer the more broth-type soups of Gina’s but this one does not disappoint. Amazing soup! My husband and I both loved it. This soup is amazing! Made tonight for the 1st time! Will definitely make again!! I made this tonight. It turned out GREAT! Thanks for an amazing recipe! Just made this for my lunch for the week and oh my word is it delicious. No more spending money at Panera. I love this site. My breakfast and lunches are now strictly Skinnytaste recipes. Thank you! Do you have an IP version? Made this soup several times with the same results. Wonderful!!!! Very flavorful and you don’t miss the heavy cream. Gave your recipe out several times. Also gave your website address. Keep them coming. Please! Loved! I roasted the broccoli, eliminated the American cheese and the soup was very creamy and tasty. Didn’t miss the cream at all. Thank you! I wanted to make this in my instant pot. Is that possible?? Is there another cheese that could be used that would still give this the same weight watchers points? Btw, I love your site and cookbook! I have been making your recipes for a few years. Delicious soup!!!! My whole family loves it. How many freestyle points is a serving of this soup? I noticed the grams of sugar isn’t listed so I can’t calculate it myself. Thank you! Best soup I have ever made. So flavourful and delicious! Can you use this recipe in a crockpot and would anything be different ? Or Instant pot since that’s all the rage :)? This is a 5 star recipe! It’s become a family favorite. Our wet winter evenings in Oregon are made warmer by this soup. I always have to double or triple the recipe; the leftovers are as well-loved as the fresh pot of this soup. This is a lengthy review- I will apologize ahead of time. A friend asked me to take his CSA share and broccoli was one of the veggies. Never been a huge fan of broccoli; I figured soup would be pretty safe. I came across this recipe and liked all the ingredients. Two days later the broccoli started looking very sad (grr) SO I had to jump on this immediately. Because the broccoli was wilting I had to incorporate what I had to make the soup, since most of the broccoli had passed its prime. This involved mainly the stalks, mushrooms and heavy cream, no milk. May I just say, soooo good! Please note, when I use mushrooms I reach for Bragg’s and Coconut amino acids, sorry, bad habit; less salt. I followed everything else (sans American cheese) this is such wonderful tasting soup. I’m so looking forward to trying the Oatmeal and Leeks soup. Not about to sub onions; which I have btw for the leeks.Totally looking forward to trying others! I made this soup recently and really loved it! My boyfriend (who is typically a carnivore / soup-hater) loved it too. I’m wondering – do you think cauliflower could be switched out for the potato? I know it would mildly affect the flavor, but was thinking the consistency might be similar? I tried it, not as good in my opinion. Thanks so much for such a delicious recipe! Curious to know how long this can be kept in the refrigerator? I made the soup last Monday night (so one week ago today). How long will it stay good and how long until I can freeze it? I would keep it 3 days in the refrigerator. Not sure how this freezes with the cheese. This is okay to freeze even though it is made with dairy products? How long can it stay in the freezer? I have made this soup many times – it’s super easy, quick and delicious! I’ve done the regular recipe, have doubled it, and just made it again and think I need to definitely triple it or maybe even quadruple it so I have loads of leftovers! I LOVE IT and my teenage kids also love it! It freezes great and is great to pack in lunches. 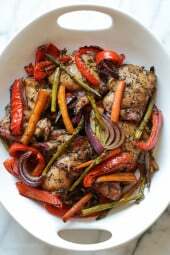 I have made many of your recipes (from your site and cookbooks) and everything is delicious! Thank you, Gina! Since we moved me and my fiancé and ten year old. I been making recipes from skinnytaste.com. Little do they know they are ww friendly and we all enjoy them!! I am not the best cook and I get tired of repeating foods. I try to watch what I eat. But thank goodness for this site. It is by far the best I have to double up recipes so there are left overs. Thanks Gina! Keep them coming!! Asking for cook books for Christmas!! ???? I just made this recipe, it’s awesome. My family will so enjoy this soup. Thank you for sharing. This is amazing soup! 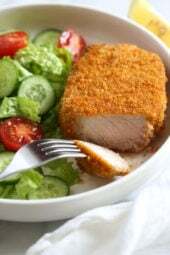 Easy to prepare but delicious taste. Better than restaurant broccoli cheese, by far!